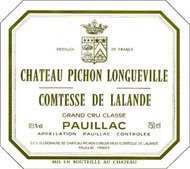 A tannic, super-concentrated effort from Pichon-Lalande, this is a blend of 51% Cabernet Sauvignon, 34% Merlot, 9% Cabernet Franc, and 6% Petit Verdot, from yields of only 33 hectolitres per hectare (45 hectolitres in 2000). It possesses a saturated purple colour in addition to a firm but promising bouquet of figs, black currant liqueur, licorice, lavender and background smoky oak. Tannic, classically structured, exceptionally pure and layered as well as tremendously persistent and long in the mouth, this will not be a wine to drink in its youth. Medium-bodied it will require 7-8 years of cellaring. It is a very impressive but structured effort from this famous estate. Anticipated maturity: 2012-2025. Tasted blind at Farr’s 2002 Bordeaux tasting. The nose is rather subdued here, leafy with sous-bois character, tobacco and scorched earth. It does lack some vigour and there is a musty quality that I cannot put my finger on. The palate has rounded tannins, quite Burgundian in texture with black cherries and raspberry, harmonious but slightly under-ripe towards the finish. Tasted October 2009.